Happy (Black) Friday. I'm guessing many of you laced up your running shoes and hit the Black Friday sales in the wee hours this morning. Hopefully, you at least had time to digest your Thanksgiving meal before racing around to the stores. Not me! I enjoy sleeping in when I'm at the in-laws, but I am going for a nice little fun run later. And I'm planning on lacing up my brand new pair of Mizuno Wave Rider 17 sent to me by my favorite Mizuno Running buddy Lori Ann to try out. 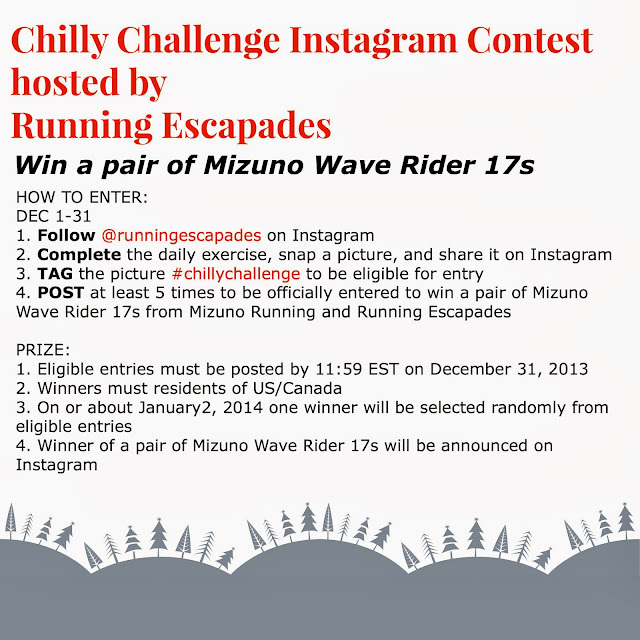 Before I go, I want to tell you how you can win a pair of Wave Rider 17s for yourself. If you follow me on Instagram or Twitter, then you already know that I love daily challenges almost as much as I love my Mizunos. This year, I used those challenges as inspiration for the 2nd Annual Chilly Challenge. Here is a calendar of the daily challenges! I look forward to seeing your Instagram pictures or videos. Update: link to calendar download here. Who's in for the Chilly Challenge this year? Tomorrow I will be celebrating my first Thanksgiving...gluten free. It should actually be pretty easy since there are several family members who have been GF for a while now, but I'm going to add some GF options to the menu myself. 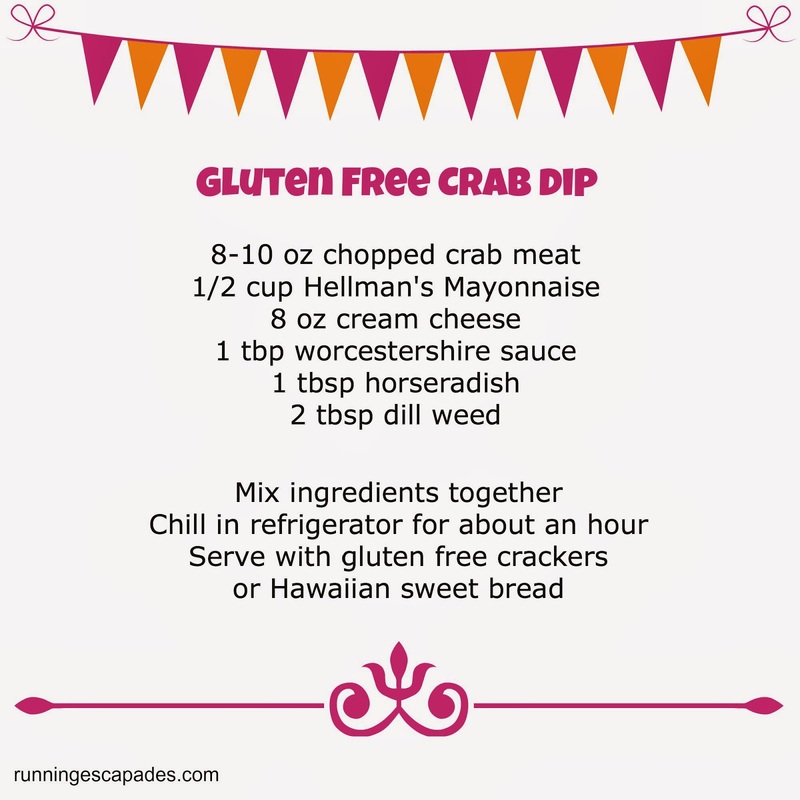 For an appetizer, I will be preparing gluten free crab dip. A good friend of mine in Cincinnati gave me this recipe and I've made it for years. Now, I just make sure to buy GF ingredients. 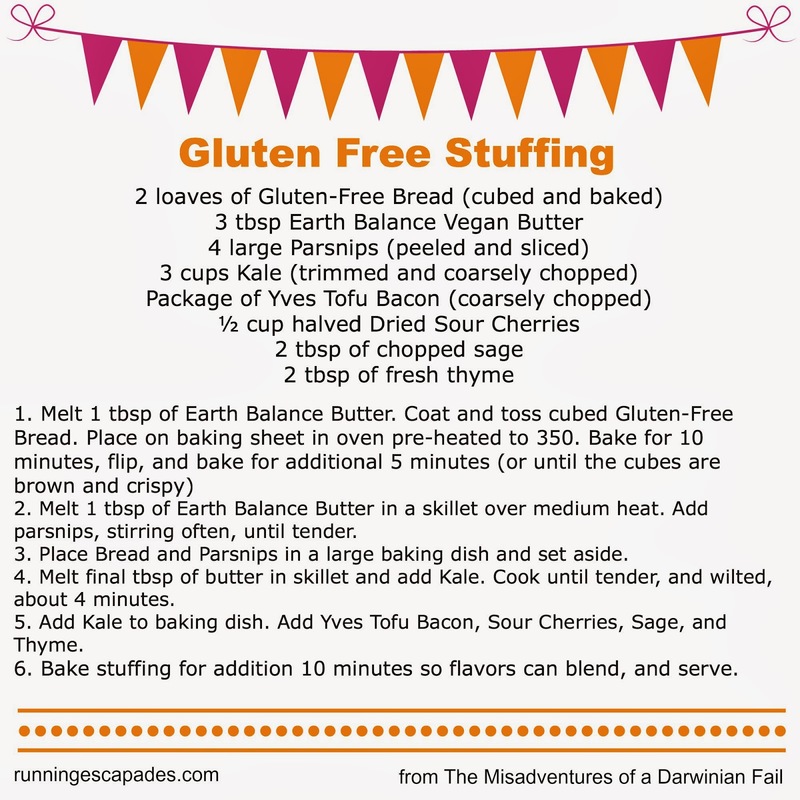 A new recipe I'll be trying is gluten free stuffing. I found a couple of great looking recipes here and here, but I will be trying the one that I found posted by my fellow FitFluential Ambassador and Mizuno lover Krysten on her blog The Misadventures of a Darwinian Fail. In addition to the appetizer and side dish, I'll be bringing along some gluten free brownies that I picked up at a local g-free bakery. They are soooo big! What item on the menu is your favorite to eat? to make? Are you avoiding any foods this year? Starting over is hard. It's hard not to think about what I used to be able to do before I went and got injured. Last week I realized that comparing myself to other HEALTHY runners was only making me unhappy. So instead I tried to embrace the season and be thankful for what I can do and remind myself that I am re-training my body the right way. So, I worked to push out the thoughts of "the old days" and was rewarded by the arrival of colder weather. My body runs better in the colder temperatures, so I am thankful to have cold day runs as I focus on slowly rebuilding my mileage base. Monday: Started another week of the #squatstreak with some squat kicks added in from the #sweataday challenge. I'm also doing one minute wall sits on my non-running days to strengthen my quads. Wednesday: Another round of Active Relase Therapy with the PT. He's still focusing on some adductors and now my ITB. Came home to some new toys from mrC. I told you he was the greatest! Thursday: Another cold two mile run, and more work on my pacing (9:59, 8:54 = 9:26). Maybe a little too fast coming back. I don't think I could hold that pace for long. Friday: Long. day. Didn't get home until after 7PM. Took the night off except for my #squatstreak. Saturday: My visit to the booty barre left me longing for another full body workout, so I reserved a board and went urban surfing. This class had tons of ab work and planks. My arms and abs were so tired afterwards. I also burned 471 calories according to my Polar FT40! Sunday: After waking to a surprise first snowfall, mrC. suggested we head to the Manchester Trail for our run. It was a seriously cold and windy 4 miles, but my legs were super toasty in my Athleta Polartec tights. I'm happy with my average pace, but I still need to work on starting slower (9:25, 9:36, 9:45, 9:32 = 9:35). If you could get rid of something "old", what would it be and why? Last week I found myself getting back in tune with my body. Trying to stick to the 10% mileage increase rule, I upped my weekly mileage slowly and paid close attention to which part of my thigh was achey, and then attacked it with the foam roller! After my runs I also made time to stretch with my yoga for runners app. The #squatstreak continued, but I found a new favorite version thanks to Shauna Harrison and the Under Armour #SweatADay challenge: in & outs. After doing 50 basic squats every day for the last 40 days, the in & out squats woke up some gluteus muscles that apparently had been snoozing through the traditional ones. Tuesday's two miles outside will probably mark the end of running in shorts, but I welcome the cold weather. I stayed on the flattest route from my driveway and kept the hamstring happy. I was feeling pretty sore after my ART session at PT on Wednesday, so Thursday's two mile treadmill run motivated by the rainy weather was fortuitous. With the pace nice and easy, I focused on my form. Saturday's "long" run of three miles was my best run of the week. It was my longest post-injury run on a hilly route which in the past would aggravate my hamstring, but it finally felt really good. On Sunday we welcomed another half marathoner to the household. My step-daughter ran the Seacoast Half and we were there to cheer her across the finish line. It was an exciting week and I like what my body is saying. What has your body been telling you lately? As a member of a fitness blogger review network, I was sent copies of some upcoming 2014 fitness titles to review. I was super excited to see that they were running related and quickly noted that they would make excellent gifts for runners. Complete Runner's Day-by Day Calendar Log: This is a year long training journal that includes logs for easy tracking and offers tips for all levels of running. The journal pages allow you to record daily mileage, race details, and more. Each month you'll find tips to keep you motivated. Even the most electronically driven runner will enjoy looking back at the stats from the previous years' log. Runner's High 2014 Day-to-Day Calendar: This is your standard desktop tear-off calendar. The daily pages offer fun facts, motivational tips, and quirky race day moments. This would look great on a runner's desk or kitchen counter. I'm happy to announce that the publisher has generously offered to let me host a giveaway of these titles! 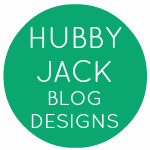 Last week I met up with the NH Bloggers & Tweeters group for the monthly Blog & Tweet event, but not before having a bowl of my husband's delicious wheat-free crock pot chili. I add crackers to my chili and like Glutino gluten free original crackers the best. 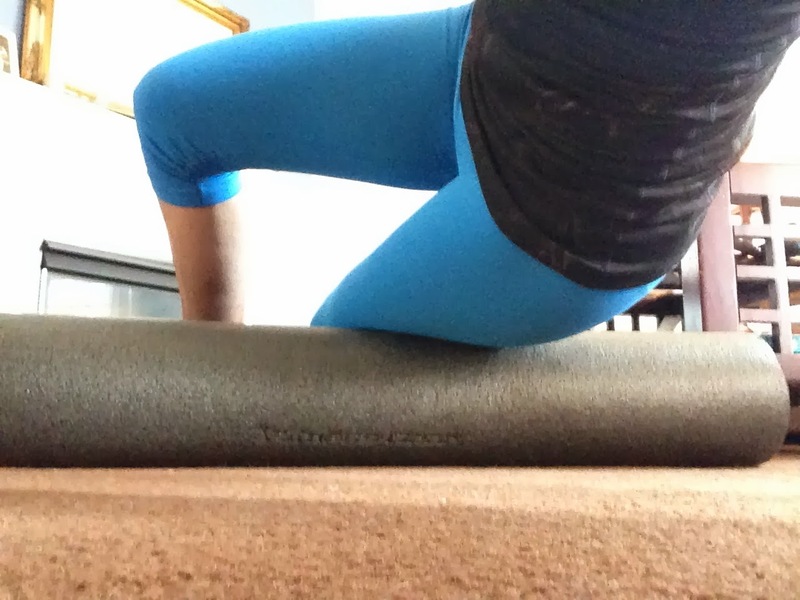 The October Blog & Tweet event was a Pilates Fitness Class at Pilates & More with Elina in Manchester. Pilates is a conditioning routine meant to help build flexibility and strength. It's a great cross training option for runners. 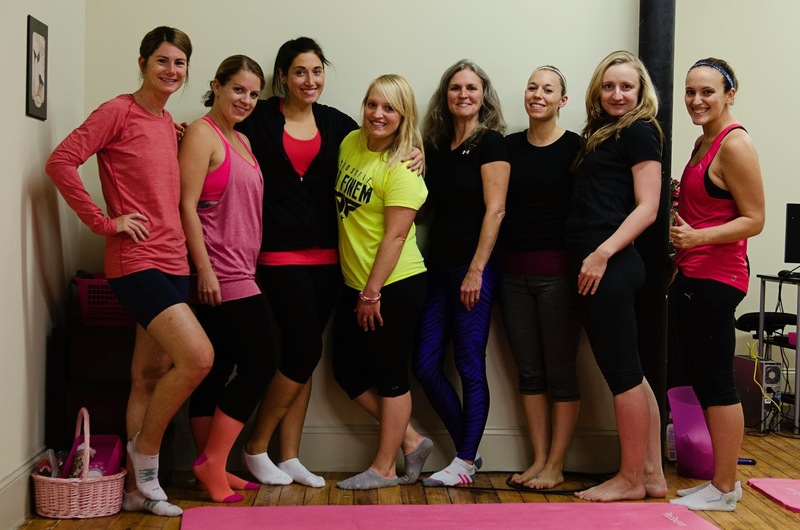 Pilates & More with Elina is located in the old mills buildings of downtown Manchester. Parking was free and easy, but finding my way to the studio inside the building was just the start of the adventure. The studio, which opened in September, was a cozy space with hard wood floors that easily accommodated our group of seven. Elina, who has 19 years fitness experience, greeted us right away and after filling out some paperwork, she led us to the Pilates mats we would be using for the class. The 45 minute Beginner's Mat class was a mix of beginner Pilates moves put together as a sequential series and a lot of giggling. That's what happens when you put a group of girls together! Some of the Pilates exercises involved a good stretch at the end, which felt awesome after Elina pushed us to do more repetitions. Even though we were not moving around a lot, I could feel my muscles tiring from the repetition or holding of positions. I wish I had remembered to wear my Polar Heart Rate monitor because I would love to know how many calories I burned in this class! Pilates & More with Elina offers a range of pricing options from $15 drop in rates to packages and private sessions. I've done Pilates before and had forgotten what a great workout it is. It was a nice change from the high energy workouts that I've become accustomed to doing. Thanks again to Allie and Janine for organizing our monthly Blog & Tweet events. And special thanks to Elina for hosting our crazy Blog & Tweet NH group! Have you ever done Pilates? What do you think? Wow! October really flew by. The truth is: I spent much of the month nursing my injuries and woking on strength training, but I also ran another race! As for working toward the remainder of my 2013 goals, it has been good and not-so-good. I knocked off my first two goals for the year, PR Half marathon and Run in NYC at the New York City Half Marathon in March. It was awesome! I was not expecting to PR, so earning my current best time of 1:57:27 was super exciting. I can't wait to be healthy again and see if I can beat it. The truth is I would be ok with keeping that PR indefinitely! 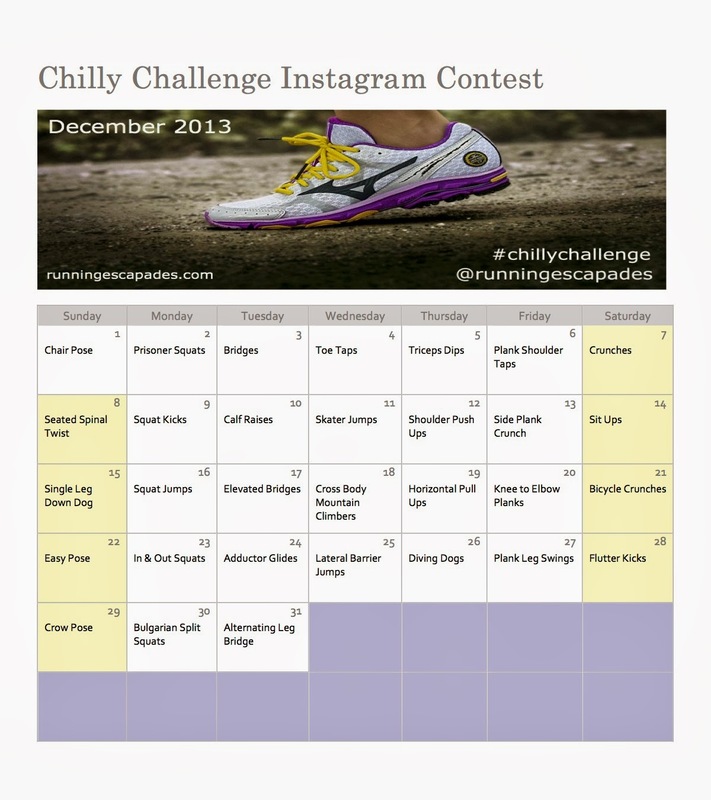 Another one of my 2013 goals is to host a fun run. I have put together a couple of group runs in honor of Boston and National Running Day, but I am hoping to organize something bigger and better still to come. The truth is I would love for this to happen before the end of the year, I just don't know now as I'm still recovering from my injuries. I added a little mileage to my goal to run 1000 miles and most of that came from pushing through the BAA Half Marathon with the help of my amazing runner husband. After the race, I really went into recovery mode and have been playing it smart as I ease back. The truth is I really began running again last week. I ran an easy mile on Monday, two miles on the treadmill on Tuesday, and two miles on Saturday. I'm determined to take things slow and get healthy in November. My running injury continued to allow me to focus on doing strength exercises consistently and a couple of challenges helped with that. The Under Armour October #SweatADay Challenge hosted by Shauna Harrison and the October #SweatFor5 by ElectraFi showed me new exercises and helped me work on my overall body strength. On Tuesday I also attended Pilates with Elina and really worked on my strength. Recap coming soon! The truth is my core is the strongest it's been since I was a kid playing high school and college soccer. When I nailed the crow pose (even for only 3 seconds) last week I was so proud of my 42 year old self!